Sam Motors Thailand and its sister company our parent company Sam Auto Group Thailand are Thailand's best exporter of Toyota Hilux Vigo, Toyota Hilux Tiger, Toyota Sport Cruiser and Toyota Sport Rider SUV. You can purchase directly from Thailand or from our Dubai branch Sam Motors Dubai. Please check pictures of Toyota Hilux Tiger, Toyota Hilux Vigo, Toyota Fortuner, Mitsubishi L200 Triton and Nissan Navara among others. Wildly popular Hilux Vigo's proud predecessor is Hilux Tiger. Please note that we are using the Toyota Tiger as a category to include Toyota D4D Tiger which was officially called Sportcruiser but is still called Toyota Tiger by some dealers. Toyota had been building cars and trucks in Thailand since 1956 and now owns three major assembly plants here, with vehicles and parts being exported to other countries. It was with the Hilux Tiger, that Toyota decided to make Thailand the hub of its manufacturing: instead of exporting Hilux from its Japanese plant, it made a strategic shift by exporting it to Australia from its Thai plant. Vigo is now being exported worldwide. The Hilux Tiger was nearly identical to most other Hiluxes of its generation, with the exception that it uses the newer D4D engine, not found in Australia, New Zealand and South African markets. In addition, Toyota manufactured several unique models in Thailand, including the Sport-Rider, among others. Sports Rider was a SUV built on Hilux platform. Pre-owned Hilux Double Cabs and Extra cab are currently in stock from 2000 till 2004 but we also acquire models of earlier years upon request. The 2001 model is TOYOTA 3.0 L EFI Engine, 4 doors, 4x4 Manual Transmission, and standard options are, Driver-side airbag, ABS Brakes, Power Steering, Power Windows, Electric Side Mirrors, Cassette Player/Radio AM FM, Fabric Seatings and A/C. Since Thailand is warm 12 months a year, none of these cars have any heaters but we can install high quality heaters for all kinds of weather. For some Images (Pics) of Toyota Hilux Tiger model 2000 and 2001 we have exported please check our page on Toyota Hilux Tiger 2000 and 2001 model with EFI engine. Toyota introduced Toyota Hilux Tiger in 1KZ engine in 2001 but later that year it introduced Tiger in its most successful engine D4D, see some Images (Pics) of Toyota Hilux Tiger D4D on our Toyota Hilux Tiger D4D page. The 5L-E is a 3.0 L (2986 cc) EFI version of the 5L engine. It is the latest member of the L family. It has a bore of 99.5 mm and stroke of 96 mm, with a compression ratio of 22.2:1. Output is 96.5 hp (72 kW) at 4000 RPM with 141.6 ft·lb (192 N·m) of torque at 2400 RPM. The L family first appeared in October 1977, it is a series of 4 cylinder diesel engines. It is the first diesel engine from Toyota to use a rubber timing belt in conjunction with a SOHC head. EFI stands for Electronic Fuel Injection. Fuel injection atomizes the fuel by forcibly pumping it through a small nozzle under high pressure. The fuel injector is only a nozzle and a valve: the power to inject the fuel comes from farther back in the fuel supply, from a pump or a pressure container. 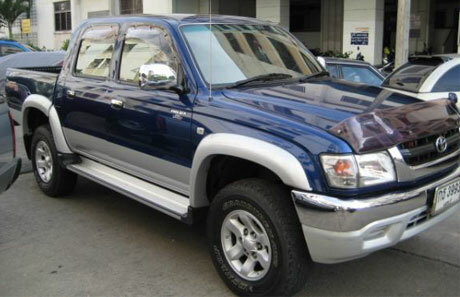 In 2001 Toyota finally decided to give the old 5L workhorse rest and first came with tested and tried 1KZ engine of Toyota Prado and then changed its mind and put D4D engine in the entire Toyota Hilux family: Toyota Hilux Tiger, Toyota Hilux Sport Cruiser and its SUV Toyota Hilux Sport Rider. Transmission: 5 Speed Manual Transmission, Floor Shift, All Forward gears synchromesh with 1 reverse. Transmission 5sp Manual, Floor Shift, All Forward gears synchromesh with 1 reverse. Toyota Hilux Tiger dealer and exporter - Sam Motors Thailand" src="images/vehicle-images/D4D-Auto-02.jpg" width="460" height="345" />As mentioend earlier, Toyota released Toyota Hilux Tiger in D4D in late 2001 but only in 2KD engine. The first 1KD Toyota Hilux Tiger was released in 2002. The D4D Tiger is officially called Toyota SportCruiser or Toyota Sport Cruiser. So if you are interested in 2002 Toyota Sport Cruiser or 2003 Sport Cruiser or 2004 Sport Cruiser, please contact us today at thai4x4@gmail.com. The Double Cabin available in the 2002 is in the 2.5 L Diesel D4D Commonrail TURBO Diesel 2 KD Engine available in the Manual Transmission in 4x4 , 4 doors and the 3.0 L Diesel D4D Commonrail Diesel TURBO 1KD Engine is available only in the AUTO 4x4 Transmission, the standard options are same as above but the 2.5 L Diesel 2KD engine is not equipped with the AIRBAG, but the 3.0 L 1KD engine is available in the same specifications as above, the shape of the 2000, 2001 and the 2002 has slightly changed, (Front Lights, Front Grill, and the Tail Lights), body is same and the interior is unchanged as well. In 2003 Toyota introduced common-rail technology. The D4D COMMONRAIL Diesel TURBO Engine was the new Technology used in the 2005 Toyota Hilux Vigo as well. For more information on Tiger, see our page on Hilux Tiger. The quality of our used vehicles is superb in their class. Customers come looking for Sam Quality vehicle in many markets. Our 97 years of integrity, honesty, great price, great customer service and great speed of delivery have created a fan base in 5 continents of the world not only among distributors and dealers but among end-users, corporations, governmental departments, NGOs and a variety of other small, medium size and large corporations. Experience the Sam Difference today by emailing us at thai4x4@gmail.com today! After hanging on to the aging 5L engine for sometime, market pressure has forced Toyota to come up with a superior engine for its sports utility line-up. With customers demanding for better performance than the normally-aspirated 5L engine can offer, Toyota has decided to install a new engine to the Hilux Tiger SR5 4x4 pick-up as well as the Sport Rider sport utility vehicle. The new engine, the turbo-charged 1KZ-TE, as well as the 5L-E (basically the 5L engine with electronic fuel management) engine both pass the strict Euro II emission standard. But most importantly, the 1KZ-TE motor offers significantly increased output with 125 ps (SAE Gross) at 3,600rpm and a massive 315Nm (EEC net) of torque at 2,000rpm. There has been confusion over the horsepower output of the new engine, which is measured in SAE Gross instead of the regular EEC net due to marketing reasons. Otherwise, the maximum power of the 1KZ-TE engine would be about 116 horsepower. Nevertheless, it is a brilliant powerplant capable of giving the SR5 tremendous performance uncommon in the pick-up truck segment. Note that this engine also powers other vehicles in the Toyota line-up including the Land Cruiser Prado and the Granvia van. Acceleration has been improved dramatically over the 5L engine and the Tiger SR5 is the quickest pick-up in the market with a best speed of almost 160km/h. Thanks to the huge amount of torque, it takes no time to accelerate from cruising speed to the truck's best speed. The gearbox doesn't require much force at all if you shift with the right timing. But during full acceleration, it tends to get stubborn and the extra time needed to shift results in lower acceleration figures. The four-wheel-drive system is easy to use, and the ADD (automatic disconnecting differential) function with shift on the fly allows the driver to switch between two and four-wheel-drive without having to sbest the vehicle. The front torsion bar and rear leaf spring suspension of the Tiger SR5 is average in terms of comfort. It has been tuned for off-road driving and in this department it is one of the best. With the high torque, the Tiger SR5 climbs up gradients comfortably. Toyota claims that it could climb at 46.5 degrees and has approach/departure angles of 36 and 25 degree respectively. Brakes are vented discs in front and drums at the rear. There are also a Super LSPV (load sensing proportioning valve) and LTS (leading trailing system) systems to improve stopping performance. The cabin is comfortable and neatly designed. The speedometer, tachometer, and gauges in the dash have white background while the steering is a four-spoke type. Among the highlights in the Tiger SR5us equipment list are driver airbag, seat belts with pretensions and force limits, laminated glass, and a four-sensor ABS system. Other standard features include power windows, power mirrors, central locking, radio-cassette player, fabric seat covers, and 15-inch alloy wheels with large 255/70 tires. Toyota has managed to make a strong comeback with an outstanding product like the Tiger SR5 1KZ-TE. But of course, sales will be determined by the success of the marketing of the product and it will be interesting to see whether Toyota and it will be interesting to see whether Toyota succeeds in reviving the sales of its pick-up truck line-up.